When Storms or Floods hit Edison, SERVPRO is ready! SERVPRO of Edison specializes in storm and flood damage restoration. Our crews are highly trained and we use specialized equipment to restore your property to its pre-storm condition. When storms hit Edison, we can scale our resources to handle a large storm or flooding disaster. We can access equipment and personnel from a network of 1,650 Franchises across the country and elite Disaster Recovery Teams that are strategically located throughout the United States. SERVPRO of Edison is an IICRC firm. The Institute of Inspection, Cleaning and Restoration Certification (IICRC) creates the standards for the restoration industry and provides training and certification to restoration companies. IICRC Certified Firms have the right to display the IICRC Certified Logo. SERVPRO of Edison specializes in the cleanup and restoration of residential and commercial property after a fire, smoke or water damage event. Our staff is highly trained in property damage restoration and we are an IICRC Certified Firm. We believe in continuous training: from initial and ongoing training at SERVPRO’s corporate training facility to regular IICRC-industry certification, rest assured our staff is equipped with the knowledge to restore your property. SERVPRO of Edison provides 24-hour emergency service and is dedicated to being faster to any-sized disaster in Edison or the surrounding area. We can respond immediately to your emergency and have the expertise to handle your restoration or cleaning needs. There's never a convenient time for fire or Water damage to strike your Edison commercial property. Every hour spent cleaning up is an hour of lost revenue and productivity. So when the need arises for professional cleaning or emergency restoration services we have the training and expertise to respond promptly with highly trained technicians to get your property back to business. Flooding and water damage events at Edison commercial properties are often complex with numerous issues that require a knowledgeable and flexible response. Whether we’re dealing with a relatively small water cleanup scenario or a large scale event, we work quickly to assess each unique situation and isolate the damaged area. In many instances, normal operations can continue in a temporary space while we restore your facility. SERVPRO of Edison specializes in the cleanup and restoration of commercial and residential property after a water damage event. Our staff is highly trained in property damage restoration. From initial and ongoing training at SERVPRO’s corporate training facility to regular IICRC-industry certification, rest assured our staff is equipped with the knowledge to restore your property. SERVPRO of Edison provides 24 hour fire and water damage restoration service in Edison and the surrounding area. 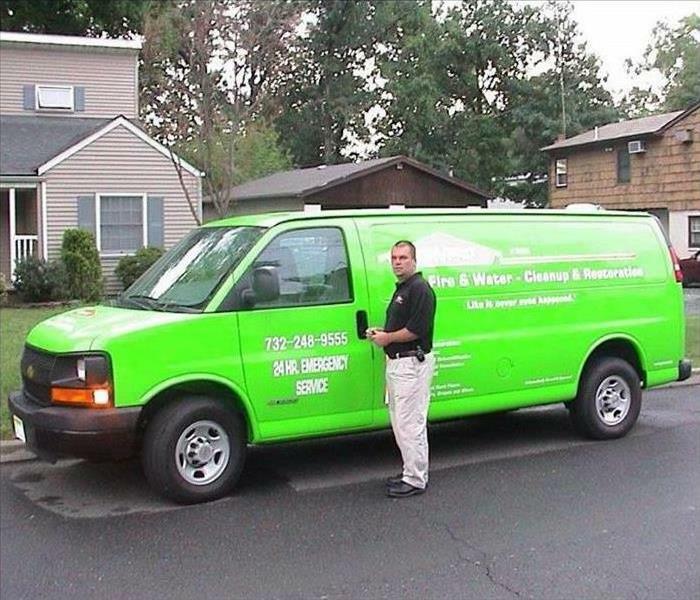 SERVPRO of Edison is available 24 hours a day for water emergencies, large or small. When you are dealing with Water Damage, immediate action is crucial. A delay of just a few hours can greatly increase the severity of the water damage. We understand that when you call us, you may be feeling confused, stressed, and vulnerable. You need an expert to guide you through this crisis. SERVPRO of Edison has the specific water damage training and experience to help you through this tough time. We specialize in water damage restoration—in fact, it's the cornerstone of our business. SERVPRO of Edison specializes in the cleanup and restoration of residential and commercial property after a fire, smoke or water damage event. Our staff is highly trained in property damage restoration. From initial and ongoing training at SERVPRO’s corporate training facility to regular IICRC-industry certification, rest assured our staff is equipped with the knowledge to restore your property. Danny Aller shows off SERVPRO's first van. 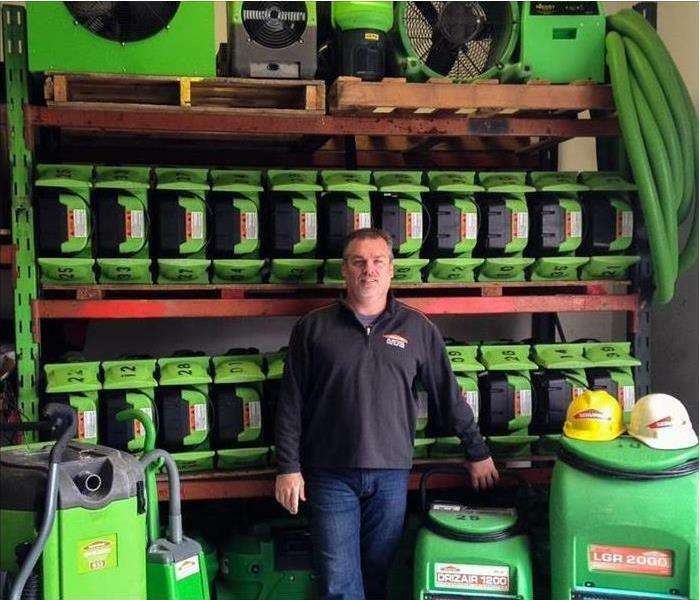 Thirteen years ago, on July 25, Danny and Karen Aller started SERVPRO of Edison with one Van, three Dehumidifiers, twelve Air Movers and one employee waiting anxiously for the phone to ring. Since that day, SERVPRO of Edison has helped countless families and businesses recover from unexpected disasters. Whether the water damage was caused by something as catastrophic as Hurricane Sandy or as mundane as a leaky faucet, SERPVRO of Edison was ready for anything. We have seen a lot over the years – basement floods, kitchen fires, moldy homes and sewage backups – you name it, we’ve cleaned it. We have been consistently expanding our knowledge base and equipment inventory. Now, in addition to Water Damage Restoration, we are able to serve the Edison area with Carpet Cleanings, HVAC Duct Cleanings, Mold Mitigation, Odor Remediation and Smoke Damage restoration. Today, SERVPRO of Edison has a warehouse full of equipment, a fleet of vehicles, and a crew of highly trained technicians who are on call 24/7, ready for whatever disaster comes next. We have come a long way in 13 years. Here’s to many more years to come. Flooding and water emergencies don’t wait for regular business hours and neither do we. SERVPRO of Edison provides emergency cleaning and restoration services 24 hours a day, 7 days a week—including all holidays. Flooding and water damage is very invasive. Water quickly spreads throughout your home and gets absorbed into floors, walls, furniture, and more. SERVPRO of Edison arrives quickly and starts the water extraction process almost immediately. This immediate response helps to minimize the damage and the cleaning and restoration costs. 3/28/2019 - When Storms or Floods hit Edison, SERVPRO is ready!